Miss Molly - Miss Molly and Ho! Ho! Ho! 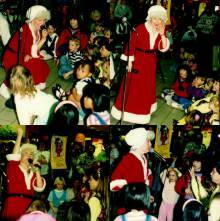 Christmas is coming and what better way to get the young and young at heart in the mood than everybody’s favorite Christmas entertainer Mrs. Claus! Miss Molly and her musicians (a.k.a. Mrs. Claus and her elves) get you and your little ones ready for Santa in this upbeat, fast -paced, all-fun, audience- participation celebration of Christmas! Miss Molly delivers a charming Christmas concert packed with opportunities for kids and their families to get actively involved in the music with singing, clapping and actions to almost every song. Dance to Miss Molly's originals "Homer's Twist" and 'Santa's Yodeling Christmas'. Fly with the reindeer in "Great Big Push", become part of the "Marvelous Toy" and sing a-long with Christmas favorites "Jingle Bells", "Away in a Manger", "Rudolf the Red-Nosed Reindeer" and many many more. Homegrown Christmas fun for everyone!